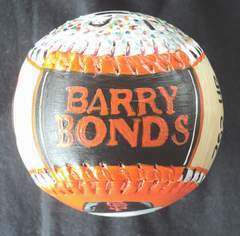 This Legends Hand Painted Barry Bonds Baseball features my two original paintings of the all time Home Run King. 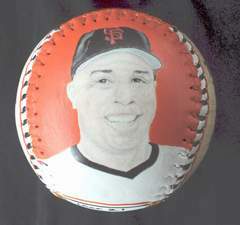 The front of the ball has my close up painting of Barry Bonds. Click here for a closer look. 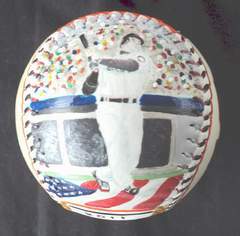 Side two has my painting of Bonds smashing a home run. The American flag is displayed below. Click here for a closer look. 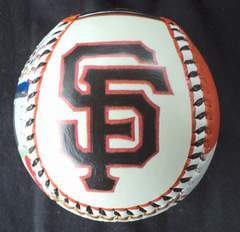 Side three is my painting of the San Francisco Giants logo. Side four has some of Barry's important lifetime stats and awards. 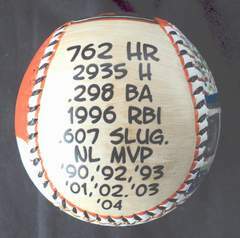 Side five, which is the top of the baseball, has Barry Bonds' hand painted name in Giant's colors. 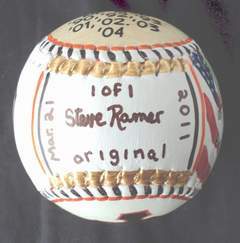 Contact Me To Purchase A Similar Baseball.